I’d venture that the cross is still one of the most identifiable images in the world today, perhaps rivaled in popular recognition and frequency of appearance only by the golden arches and the Nike swoosh. 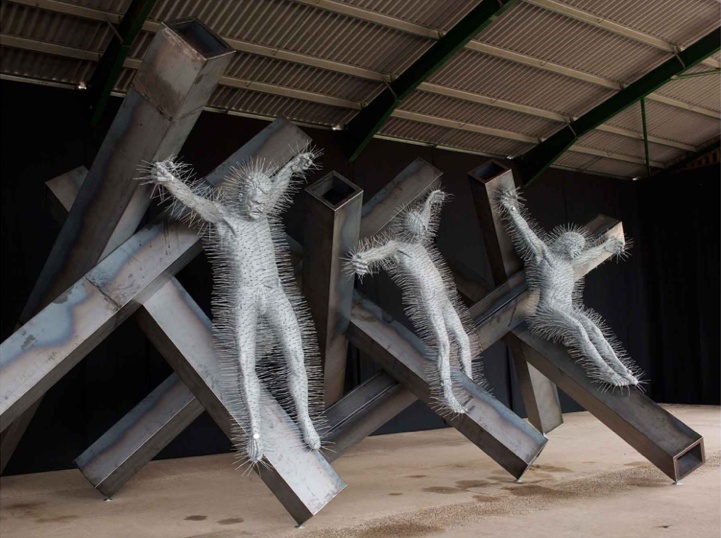 Yet, while it may pop up more consistently before the human eye than most other trademarks, increasingly the cross has been stripped of its narrative, becoming little more than a meaningless fashion accessory in the minds of many. A few years back someone passed along to me an article they had clipped from a women’s fashion magazine. It outlined the “musts” of crosses as accessories. Accompanied by a collage of photos, the piece offered advice on colors, sizes and styles, all depending on the outfit you were wearing, your hairstyle, your height, your weight. Now, I don’t know how all of this makes you feel. Would it surprise you if I confessed that I’m not all that bothered by it? A general populace that doesn’t grasp the importance of this key Christian symbol does not astonish me. I am quite disturbed, however, when we Christians underestimate its significance. 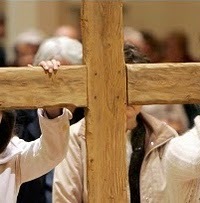 No doubt, we are well aware that the cross plays a central role in the Christian imagination. We sing of it in our hymns, speak of it in our prayers, hear it referenced in readings and sermons, and gaze at it week by week. Many of us trace it on our foreheads or across our bodies. However, I wonder if, in some sense, the cross has become too insubstantial for us. To what degree do we allow it to contour the shape our lives and quicken our perception of who we really are? The cross didn’t always lend itself so readily, of course, to either religious devotion or jewelry design. As you may know, in the first century of the Common Era it was a form of execution, meant to rob those who opposed the Empire not only of their life, but also their humanity. It was also an effective means of keeping conquered peoples in their place. “Disturb the pax Romana,” it said, “and this will be your story!” It was the ultimate dead end, a grim reminder to despairing people of their powerlessness. However, not long after they encountered a crucified Jesus freshly burst forth from the tomb, Christians employed this image to tell the story of a totally different reality: that of a God who was transforming not only human life, but also the whole of creation. The structures of domineering power, the way of “might makes right,” peace by force, division by rank or class, exploitation for gain – all were shown to have no teeth. A new reality was breaking in – call it the Kingdom of God – and the cross became the sign that nothing could prevent God from setting things right. In next to no time, the cross became the mark of a people who had set about living according to this new order, even if it had yet to fully arrive. That understanding is a far cry from a church that sees the cross’s story as one only concerned with the assurance of individual salvation rather than the liberation of the whole cosmos, as one only about the promise that Christ will help me cope with my issues in this world rather than shape me to live by the new world already underway. Perhaps that makes Good Friday – the whole Paschal Triduum really – such a gift. The cross always stands central to what we are about. However, there are times when we need extra prompting and prodding to appreciate just what this symbol, this story means to us as the Body of Christ. Very dramatic things can happen, it seems to me, when ordinary people allow the gospel to shape their lives. In the church’s continual act of reading the lives of ordinary people into the story of Jesus, character is formed and a new world is offered. I saw a wonderful documentary a number of years back. It chronicled some extraordinary deeds by some very ordinary folk the little French community of Le Chambon. 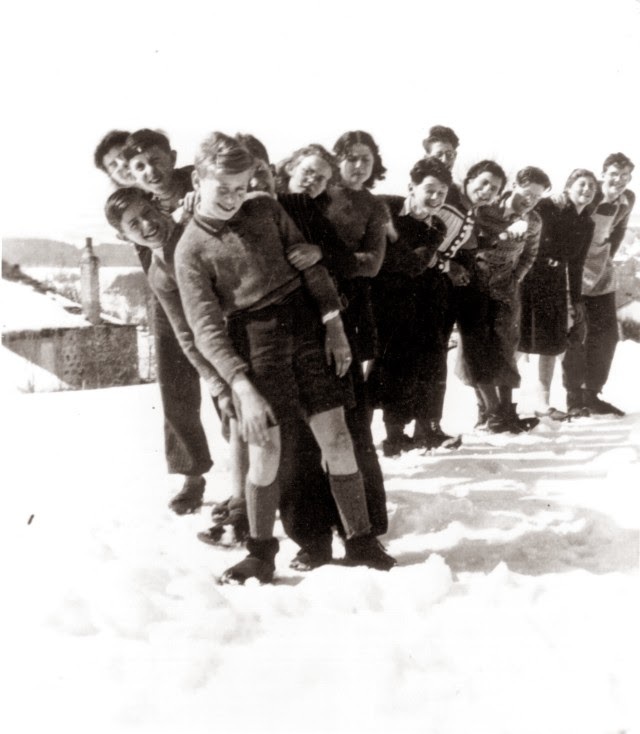 During the Nazi occupation of France, more than three thousand Jewish refugees were rescued by these ordinary people, most of whom were Huguenots. In 1942, buses showed up to cart away Jews. The Vichy police demanded to be shown where the Jews were being hid. The pastor and people of the town refused to comply. In a climate where Jews were marginalized and persecuted, this community welcomed them into their homes and hid them at substantial risk. Its people would sing to call their Jewish neighbors out into the open when the immediate danger had passed. I find it just as impressive that these people resisted the police with all the cunning at their disposal to prevent the hidden Jews from being discovered, but they never attempted any violence in doing so. Why? Because they were shaped by the story of Jesus. They believed that even the police were their neighbors. In the church’s continual act of reading the lives of ordinary people into the story of Jesus, character is formed and a new world is offered. Everything we are, everything we're called to be is wrapped up in Christ crucified. The cross stood for scandal in the past, and seems today to be nothing more than a meaningless fashion accessory to many. But for those of us who believe, it is the way of life. It is the revelation of the One who is our meaning and promise. It is the story contouring the shape of our lives. Thank you, Jay. 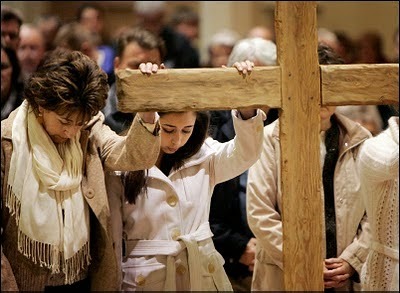 I once heard a story of a woman who entered a jewelry store wanting to buy a cross. The clerk asked, "Do you want a plain one or one with a little man on it?" Yes, I have heard similar stories, including that of sales clerk who didn't know what a cross was when asked for one at a jewelry counter. 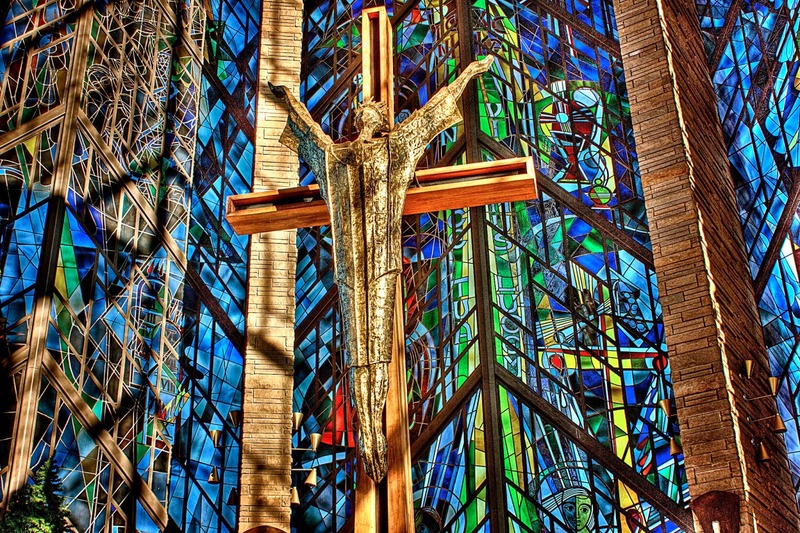 Where is the photo of the Crucifix with the modern stained glass windows in the background taken? Is this your photo? I'd like to use it in a publication. I usually record these things and don't seem to have done so this time. I believe it is from Chapel of the Resurrection, Valparaiso University in Indiana. Oh, and it is not one of my photos. I admit that when it comes to crosses I look somewhat as a fashionista because the youth at church and my husband have given me many over the years and I feel compelled to wear them to show them how much their gift was appreciated.